Bo has performed an amazing 12,000 shows so far & has shared the stage with: Bill Gates, Glenn Close, Lee Iacocca, Terry Bradshaw, Tom Bodett, “Mary Kay” Ash and many other celebrities. He has been a featured performer at the Kennedy Center in Washington, D.C. and was honored with the prestigious "Telly Award" for his comedy writing and performing. He has been seen on "Good Morning America", CNN, the BBC, and Good Morning Texas. 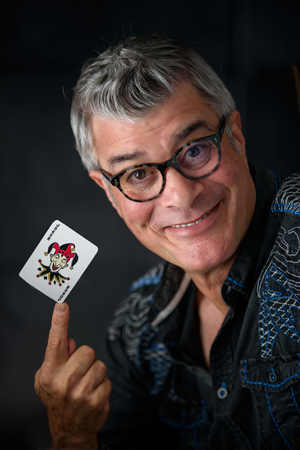 Bo performs his special blend of Comedy, Magic and Audience Interaction over 150 times a year across the United States, appearing at TRADE SHOWS, PARTIES, CORPORATE FUNCTIONS, BUSINESS MEETINGS and every kind of special event imaginable. Experience makes the difference! Bo, a native of New York City, began his performing career as a recording artist (voice & percussion). He segued into a career on the legitimate stage in New York, performing in such hits as the "Tony Award" winning musical, "Barnum", "West Side Story" and "A Chorus Line".